I think my friend Vicki summed it up when she said in her review that this book was part Brilliant and Part plain silly as that is totally how I feel about this book. I loved the main character Tess and enjoyed getting to know her as a character. She is one of those character you really want to root for as she really has it tough. I loved finding out more about the world she lived in and the things she dealt with on a daily basis. I loved the main setting of this book (how could the historian in me not?) and I loved getting to know the Titanic through Tess's eyes. I loved the relationship that developed between Tess and Alec and loved seeing that actually at the end of the day they really had this real connection despite being told they shouldn't by the society they lived in. The werewolf story was just plain silly. I thought it made what could have been a really nice story really laughable in place where I don't think the author intended it to be. The ending started off being really fitting to the entire book but then was spoiled by the last chapter ... thinking cynically as a way to spin out another book or two in the series. So all in all not a bad read but I'm not sure I'll continue on with the series any further. 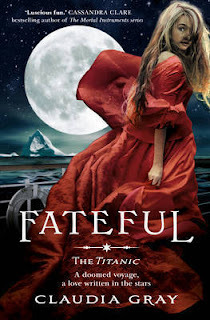 I'm intrigued enough by the Titanic part - I've had a lingering interest about the Titanic since as far back as I can remember so would be fab to see a characters point of view of the ship!